Emmet and Molly will be at the Biggest Little Spring Market in Middleville on Sunday April 22nd from 9 am to 4 pm. The Christmas show was so much fun, I just had to haul Emmet with me on this one. In is in the Hall next to the Middleville Fair Grounds on Wolf Grove road between Hood and Almonte. It will be a real family event. We have a tiny space.. half a regular show, that we will be cramming with all things tiny. For Molly – small critters, charms, earrings. 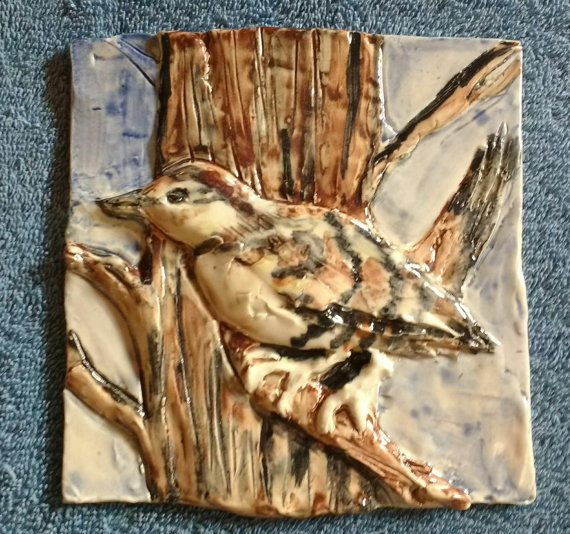 Molly will have a show with more tiles fresh from the kiln on May 5th and 6th, at the Carleton Place Canoe Club – from 10 to 4. Ah Black Friday. The biggest shopping day of the year in the US, which Canadians are trying to emulate. So many feelings. I am not a lover of commercialism. That said – I love supporting the arts – from theatre, to concerts, to the visual arts to your local busker. In this world of buy less… those that are the most effected are local artisians. Many of us have phone and internet accounts with large data limits. These electronics take a good bit of change. These companies are often advertising us on there latest tech. items… to take us to brave new worlds. On shrinking incomes, these accounts and devices take more and more of the pie. Facebook, Netflix, Messenger also take more of our time and energy. I certainly have to make concious decisions to walk outside and breath in the fresh air, let alone taking time to go to local concerts and shows. In the midst of this we are encouraged to buy nothing… to do more simple holidays with family and friends. The impact of this is not less tech devices … or Walmart goods. Where one sees the impact is art and craft shows. It means that fewer artisans are able to make a living. So I challenge myself and each of you to buy some art this holiday season. This was started to talk about one of my favourite little artisan craft shows that is celebrating it’s 24th year in Perth, on Dec. 2nd. – The Nick of Time Artisan Craft Show. 10 – 3 in McMartin house – before the night parade. I have fond memories of Amanda Lewis doing Caligraphy Tree Ornaments in this show. Last year there were Tie Died Sneakers… It is a show full of delightful surprises… as well as being able to buy shortbread and support The Steven Lewis Foundation – Granny to Granny project, purchase candles and chocolate for the season. The next day there is a new show – The Biggest Little Christmas Market in Middleville Community Center, in the Lanark Highlands from 10 – 4, complete with Children’s craft table, Santa… really a whole community event. Which is the other part of these shows – they are part of building community. So I challenge each of you to go out to some local arts and crafts markets this season. Feel free to buy something you find charming, and support your community and your local artisans. Being a person of little means, I can’t go out and hire a photographer to photograph my artwork. In fact I work on a small laptop, so I can’t buy the Adobe software, that gets recommended by lots of websites. My tools are an aging Canon digital camera, a free on line photo editor and iphoto on my aging Mac Air. Plus the great outdoors and it’s beautiful natural light. Last summer I hired Emmet to take some photos. They are awesome. The light is perfect, and she really captured the animals. All in all I keep changing how I photograph, or the light is differant, from one hour to another… And I end up with photographs with backgrounds in MANY different colours and many differant shades of that colour depending on time of day, ie light. I’ll share solutions I come up with as I go along. And if you have any thoughts, stories… please send me an email at mollycritters@gmail.com I’d love to hear from you. The Pit Fire was unloaded this morning. We all gathered round and unloaded our pieces, dumping the ash out of our cans. The pieces in the back were mostly black. Rosie’s dear fox – exploded, so I will not put in a piece that I can’t bisque first. Pieces near the chimney had hardly any colour, though Lyndal’s turtles had some lovely peach colour from the banana peel, and Jan got some lovely rust colour from the seaweed. The mica terra sig. gave some lovely sparkle, even through the black on my rune stones. Victoria got a little colour from the oxides she added to her terra sig. as well. And Jan’s Hedgehog was black on the inside, where there were coffee grounds, and stayed shiny, but with more dark spots on the terra sig and burnished side. I have been wanting to do a pit fire YEARS, and I am finally getting it done. 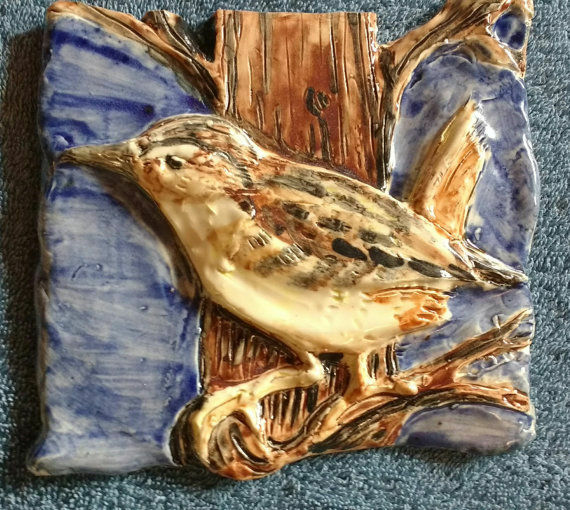 Folks from the MERA Pottery created one or two pieces each from: Tuckers brown (^6) or white (^10) sculptural Clay. Some are covered with Terra Sig. and or Terra Sig. mixed with Mica Power, found by local prospectors – Moses and Deb. All but the fox were bisque fired to cone 018. I built the pit kiln in our back yard, open shelter, designed to use for making maple syrup in the spring, and doing pit and raku firing other times in the year. The shed was finally finished late last fall, and we had our first maple syrup season in it this spring. Wood chips and scraps from next winters fire wood. The Pit Fire is happening Monday. So stay tuned. For Emmet’s news go to: Emmet L.F. Cameron on Patreon. For just $3 a month, and get access to much of Emmet’s work. June held writing workshops, with ideas from those workshops sure to be included in future postings. Molly has been regularly posting on the Critters and Tales Facebook page. Seems like a good time to finally update here. A delightful collection of art, innovative craft, smoke fired animals… Each corner of the gallery holds another delight in a large variety of media from paintings, pottery, glass and wood to fabric arts. As varied as going into the Ontario or Cape Breton centre for Arts & Crafts. Insightful new work here constantly. Molly is so happy to be included in the work this year, WOW! The Sunset Gallery has a large collection of wooden carved folkart focusing on William Roach. His studio is on the property, and is open, when he is available. There is also a large collection of rug hooking, prints and more. Frog Pond Cafe, with great pastries and coffee. A place to sit and watch the birds. We saw a grackle, cardinals, sparrows… while we we there this time. William Roach’s work and the other Folk Art in this gallery is truly unique. Visiting here, always brings me laughter and makes me think about perception. 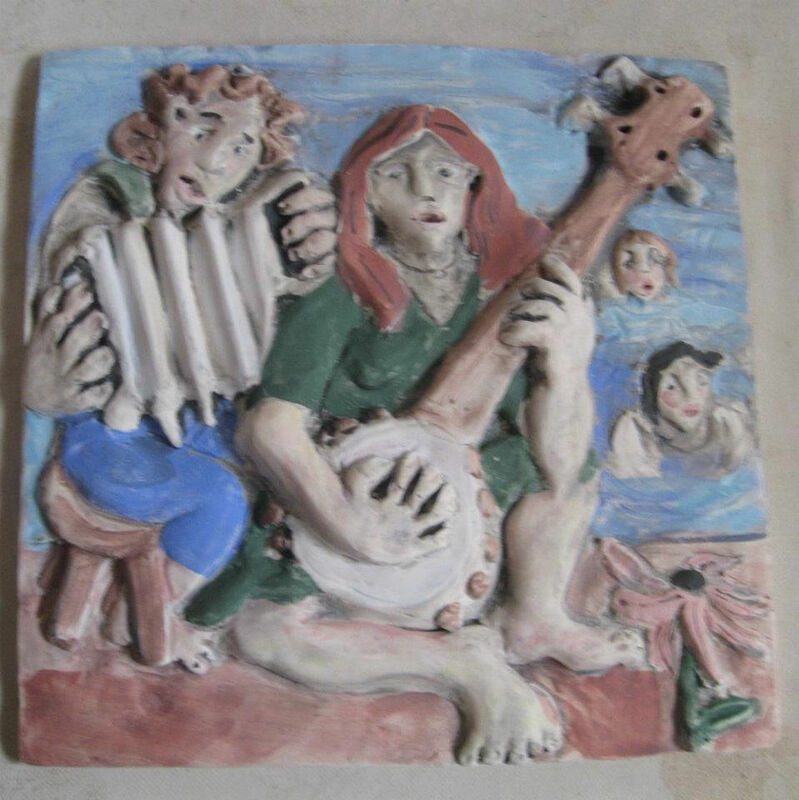 A lifetime dream of Molly’s to be included in real folk art gallery, with a shared vision of art. This little shop in Louisbourg is run by Margaret Smith, a native to Louisbourg. Her and her assistant are full of many wonderful stories about Louisbourg over the years. The front of her shop is full of tall ship models, with affordable simple models you can build. Margaret has a small collection of books on Louisbourg. With a variety of delights in every corner. Molly looks forward to all the knowledge and community to be gained here. Hope you all are having a healthy happy Summer.